Colonel Yuval Gaz was appointed on Monday as the regional brigade commander of the Binyamin region. Colonel Yuval Gaz was appointed on Monday as the regional brigade commander of the Binyamin region. Binyamin is the region east of Jerusalem, which encompasses Yericho and Shiloh. Although it is a separate region, Binyamin is often lumped together Judea and Samaria, and is ruled under the same regional martial law. The ceremony was held in the area of ancient Shiloh, in the presence of Judea and Samaria Division Commander Brigadier General Lior Carmeli. Gaz, who in the past commanded the Maglan unit, will replace Colonel Yisrael Shomer in his duties. Shomer served as the regional brigade commander of Binyamin for two years. "The change-of-command ceremony for the Binyamin region occurs at a challenging time, which obligates us to change, to quickly adapt our response, and to continually strive for the highest threshold of excellence," said the division commander. Carmeli then turned to Shomer, "You brought to the task the 'complete command' which is your greatest strength - a high level of values, the necessary balanced observation needed for this multi-faceted reality, realistic operational thinking, and the ability to identify failures and turn them into learning and improvement experiences." To the incoming Gaz, Carmeli said, "You are coming to the task after a significant period of commanding the Maglan unit, and with deep familiarity with the complexities of Judea and Samaria. Today, you receive the command of a complex region, arise and succeed." Maglan is a special forces unit which specializes in operating behind enemy lines. Shomer then took to the stand, "Yuval, I pass on to you today the command of the Binyamin region. 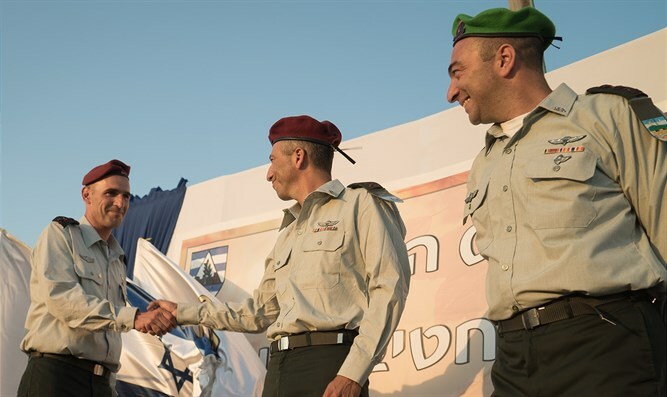 I am certain that through your experience and skills as a leader and commander, you will continue to lead and drive the Binyamin region to new heights," the outgoing commander gave his blessing.